First and foremost, CONGRATULATIONS to everyone who participated in tryouts! I was blown away by the hard work, dedication and courage (tryouts can be scary!) shown by each and every one of you on Saturday, it was so much fun to watch and see how much you have all improved since last year. The results are out, so check your inbox if you tried out for emails about your new team placement or mentors. Guys’ and Girls’ Night is this Saturday! Get ready to get dressed up for a night of camaraderie and dancing as we kick off the semester in the best possible way. Come eat, drink, and welcome our new members in this team-wide event you’ll be talking about for days to come. Some people on the team like to dress up for the night (girls in cocktail/going out dresses, guys in a nice shirt and slacks) but this is completely optional! Private event information to follow on Saturday via the paid membership email list. You must pay your $60 semester dues to attend Guys’ and Girls’ Night! Practice space this week: We’ve got practice space in the League ballroom on Monday and Friday evening, so come and practice standard!!! We only have ballroom practice space a couple of times per semester, so take advantage of this rare opportunity! Recruitment: This is our last week to recruit newcomers to build a strong future for our team, so please come out to our free lessons on Monday, Thursday and Saturday, dance with the newcomers and make them feel welcome to the team! 8-10pm: Our second big Welcome Week event! Invite your friends, wear your ballroom apparel, dance with some newcomers and cheer your teammates on as they perform their showcases! No DTS, come to the welcome week event instead! No DTS, come to the CCRB instead! 4.30-6pm: FINAL Free Newcomer Lesson! Come join us for the last free lesson, taught by Steve and Susan. After this lesson, team membership is required to attend the lessons so be sure to pay dues! Cash, check, card, Venmo, and Paypal are all accepted at any of the lessons this week. 8:00pm – ??? : Guys’ and Girls’ Night!!! Join us for the best night of the semester, and welcome our new members. More information, times, and locations will be sent out to our paid email list, so be sure to pay dues by Saturday!!! Your ballroom team membership comes with a complimentary membership to the ballroom club! 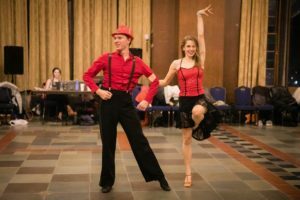 The Ballroom Dance Club meets once a week on Sundays and provides a relaxed, social environment to learn ballroom alongside the wider Ann Arbor community. You do not need to be a student to attend. Check their website here for updates on times, locations and their schedule for this week!